The Market Measures survey benchmarks the sales and marketing activity of New Zealand’s technology companies, providing you with useful information for planning your sales and marketing strategies. By participating in the study you can compare your company’s performance against your peers and US counterparts. The survey closes at the end of the day on Thursday 13 September 2018. Entries are now being accepted for the 2018 An Angel at My Table event, a ‘Dragons Den’ type competition open to all comers. …we’d love to hear from you. Entry is quick and easy, and there is no entry fee. Four finalists will be chosen to pitch to our Dragons’ Den-style panel of three experienced angel investors at the NZSA dinner on Tuesday 14 August. Finalists will be provided with a personal pitching coach to help them prepare for the big night. looking for investment, with a plan for why investment is needed. Dates for mentoring, pitch practice and deadline for presentation slides to be agreed with your mentor. Event details: An Angel at My Table, Tuesday 14 August 2018 (5.30pm start) at Glengarry’s Wine Room, cnr Wellesley and Sale Streets, Auckland. Includes a wine tasting hosted by Glengarry’s and dinner for the presenter plus a support person. Five minute pitch and five minutes’ angel negotiation per entrant. This competition is intended to be an informal, light-hearted, and enjoyable evening. We’ll keep the rules simple, and act fairly and impartially. Although prize money is available, we’re not experts running a formal competition. Enjoy yourself, join us for dinner and some wine, meet some great people and hopefully have a few laughs. Market Measures 2017 survey is now live. The Market Measures survey benchmarks the sales and marketing activity of New Zealand’s technology companies, providing you with useful information for planning your sales and marketing strategies. By participating in the study you can compare your company’s performance against your peers and US counterparts. You will be emailed the results of the study, including the final report due out in October 2017 (worth $375), resources like eBooks, infographics and videos, and the opportunity to attend events nationwide discussing Market Measures results and implications. The survey closes at the end of the day on Thursday 5 October. 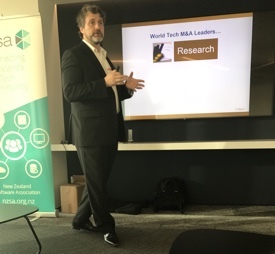 NZSA members enjoyed a fantastic briefing from tech M&A expert Dan Bernstein from the Corum Group. Dan shared many insightful tips with the audience on how record cash, disruptive change, aggressive new buyers and rising valuations are making this the best time to sell in a decade. 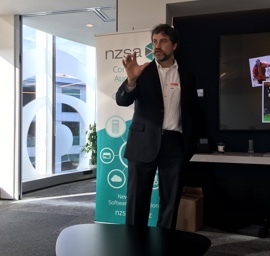 Many thanks to IBM and ClearPoint for making this invaluable session possible for NZSA members. A collaborative report from New Zealand’s top technology organisations have released a manifesto of our “digital future”. The report, which outlines key goals for the tech industry, was also sent to every member of Parliament. One of the major proposals from the report is the establishment of a dedicated Ministry of the Future. Twenty organisations collaborated on the report, including TUANZ, InternetNZ and IT Professionals.